Andy's Forum > Categories > ALTERNATIVE HEALTH > "I was poisoned by chronic exposure to toxic elements lurking in organic foods"
I'd like to thank all the Natural News readers for your support as I'm engaged in intensive laboratory research and not posting very many stories right now. This will continue through early January up until we break our big announcements on food science. You may have heard some rumors that I discovered I've been exposed to a chronic, accumulative, low level of toxic elements (poisons) over the last couple of years. This rumor is true, and over the last several months, I have been able to identify the sources of those poisons and remove them from my diet and my environment. Some of these poisons are still coming out of my hair and urine, but overall levels have dropped dramatically. At no time were the exposures acute. I'm talking about an ongoing low level of exposure that builds up over time, not an emergency level at any one time. • I was being poisoned with cadmium from eating USDA certified organic jerky product. It contained 4,000 ppb cadmium. (Fortunately I didn't eat much of it.) I was also being poisoned with cadmium found in organic brown rice at 3,000 ppb. • Shockingly, I was being poisoned with lead from growing and eating my own sprouts. Through analytical testing, I discovered that these sprouts contained 400 ppb of lead due to the seeds coming from an unclean source. This was absolutely astonishing because I always assumed sprouts were healthy. It turns out they can also be toxic if the seeds are contaminated. Unless I had access to my own lab, I never would have gone to the trouble of testing sprouts for lead. • I was being poisoned with high levels of aluminum from a dietary supplement that almost no one realizes is loaded with aluminum. In detailed laboratory testing, I was able to show that this substance releases massive amounts of aluminum into the GI tract, drastically raising blood aluminum levels and also increasing aluminum levels in urine. I've gone to great lengths to try to avoid exposure to aluminum, so this finding was especially disturbing. Thankfully, all these exposures were of relatively low levels, and because my diet is so rich in healthful nutrients, botanicals and whole foods, I was able to eliminate these toxic elements rather quickly once I nailed down the sources of exposure. The truly shocking thing is that as the toxic metals came out, my brain "awakened" and my outlook on life shifted dramatically. On the physical side, you may have noticed from my lab photo that I've slimmed down considerably as my body weight is coming back into healthful balance. I will share much more of this story with you in January, when we launch a series of breakthroughs in food science and environmental medicine. These findings on toxins in our food are one small part of what we have in store for you. This experience of discovering I was being poisoned by "healthy" foods and products has made an enormous impact on my mission for Natural News readers and fans. I've come to realize that it is crucial that I share these findings with you so that you can avoid the chronic poisoning under which we are all suffering. And while eating organic food was exposing me to low levels of toxins, people who eat conventional processed foods are being poisoned to a far greater degree -- with devastating results for their health. I feel incredibly blessed that I have been granted the intellectual and financial capacity to have identified these toxic exposures in my own life, and now the next most important step is sharing these findings with you. Your support of Natural News and our Natural News Store has made this possible, so thank you for your generous support. 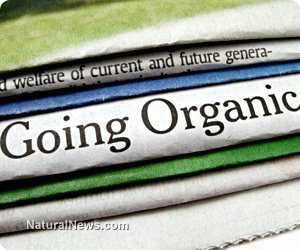 Get ready for a whirlwind of mind-blowing information from Natural News in 2014. We are going to empower you with new findings, knowledge, wisdom and a wealth of data that will revolutionize your life for the better. What I've hinted at here just barely scratches the surface of what we will be unveiling in just one month!